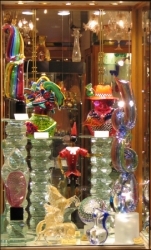 Venetian Glass Wednesday,17 June 2004. Reach Venice Mestre from Florence . The “real” Venice is a small island off the mainland. 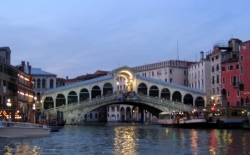 There is one railway line and roadway connecting the island of Venice to the mainland on a mile long bridge. We take the local train to Venice ,Santa Lucia. The only train station in the island of Venice . The only mode of transportation further on is boats or by foot. We check in the Hotel Santa Lucia near the railway station. The rooms are decent; the yellow bedspreads give a cheerful feel to the room. 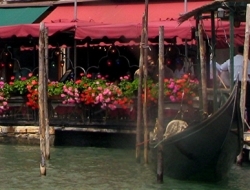 We take the vaporetto or the local water “bus” from the Santa Lucia to the St. Mark’s square via the Grand Canal . Seejo is in a trigger happy mode on the vaporetto clicking pictures of all the buildings lining the canal. The Grand Canal is not as wide as I expect. 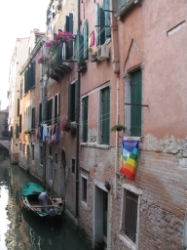 It threads its way thru the centre of the city of Venice with houses, hotels and offices on either side of the canal. The construction of the buildings is slightly different from the rest of Italian structures that we had seen so far. The minarets that crown the old buildings reveal a distinct Islamic influence, which the guide book informs us is because of the close trade relationship that Venice had with the Byzantine empire in early thirteenth century when Venice was an important and wealthy trading port We pass several other boats on the canal, water taxis zooming past us, the odd police boat monitoring the waters and several gondoliers rowing their sleek black gondolas. 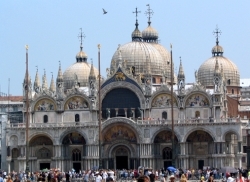 Just as the Grand Canal reaches St. Marks square it opens up into a wide lagoon. On the far side from St. Marks square, we notice the other islands of Murano and Lido . St. Marks square is impressive. Seejo and I are mesmerized. Inspite of the huge crowd gathered there …there is romance in the air. In the fading daylight, there, groups of hungry tourists are bunched around in front of various restaurants. Musicians serenade them as they have an outdoor candlelight dinner. Some couples are dancing away oblivious of the people around. Artists have set up easels and are painting the Basilica The street vendors are trying to sell souvenirs, children are rushing around the place squealing. At the other end the cathedral is illuminated, seems more like a mosque. We stand apart taking in the surroundings. A nice old couple offers to take a picture of both of us in front of the Basilica. We happily pose for a series of photographs. We reciprocate by taking a few of theirs. 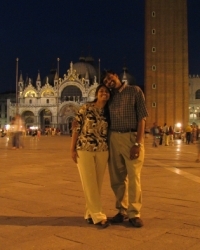 We wander around the area near the St. Mark’s square. A street musicians is creating the most wonderful sounds by tinkling with a few half filled glass bottles. We enjoy the jal tarang for sometime. Seejo gives him all the change that we had. There is another innovative salesman dressed as a marble bust, with his face painted in off white. There are tiny alleys branching out in various directions. We follow one of these till we come to a small Osteria where we have dinner. The food is excellent; risotto, pasta and a selection of appetizers selected from the bar, one of the best we have sampled in Italy . We set out after dinner to out hotel back to the Santa Lucia for some much needed sleep. Breakfast is in the small garden outside hotel Lucia. Cereal, breakfast bars, toast with butter jam and honey, milk and orange juice. After breakfast, we check out of the hotel, store our bags with the concierge and then make our way to the vaporetto stop to catch the vaporetto back to the Basilica. 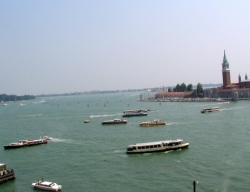 The vaporetto stops at around 10 stops between Santa Lucia and the St. Marks square. At each stop, lots of people get in. Everybody seems to be on their way to the square. We are back at St. Mark’s square. The square looks a little different in day time. 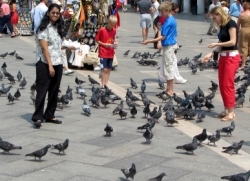 The amount of people are just the same but it is possibly due to the flock of pigeons at the square. They outnumber the humans by atleast 2 to 1. Clever vendors sell bird seed for about a euro. The kids seem to be enjoying it. People were covered in those dratted birds. Put some seed on your head and you have three birds perched on your head. We make our way across the square to the Correr museum on the opposite side. 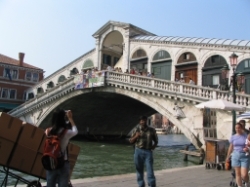 The Correr museum has the best of Venetian paintings and sculptures. The museum has more than 40 rooms each one carrying some historical exhibits of the city of Venice ,including weaponry and armors ,maps and coins, and paintings that depict the glory of the once flourishing Venetian empire. 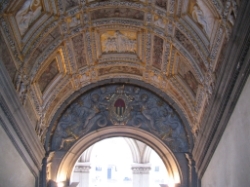 The famous bridge of sighs connects the Doge Palace to the dungeons underground where political dissidents were imprisoned. 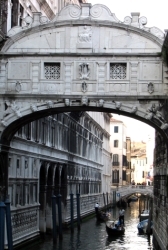 The bridge of sighs, so called ,because the prisoners ,got their last glimpse of the Venetian sunshine before being carted off to the dreary dungeons. The prison was rows and rows of tiny cold cells with wooden planks for bed and a small shelf which would hold their meager possessions. Since Venice is surrounded by water, the dungeons were below the water level. We escape from the cold dungeons to the hot sun and immediately move in search of shade to the interior of the Basilica. The basilica is magnificent as most of the Italian churches were. However after the churches of Rome and Vatican , the interior is not as impressive. 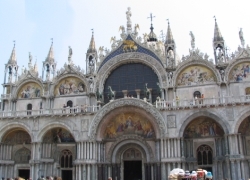 There is also a huge mosaic of the how St. Marks remains was smuggled into Venice from Egypt ( in a pork barrel, as pork is unclean for Muslims) making Venice an important city in the Christian world. The mosaic on the dome of the church shows vignettes from the bible. The church is built in Greek cross style with the the arms of the cross having equal sizes. I am more taken by the grandeur of the external facade. People are queing up to get up to the bell tower of the Basilica. But we know an insider ti, thanks to the guide at the Correr museum. He advised us to go over to the San Giorgio Maggiore island for a better view. We make our way to the opposite island pg San Giorgio Maggiore. That was easier said than done. It took ages to figure out the right vaporetto to get there. It did nt help that they were all called # 1. After about an hour we reach the tiny island which has only a area enough for the church and its bell tower. The church was a simple church, By now I have got used to paintings. I notice that there is a Last Supper near the altar. We make our way to the back of the church for the elevator to the top of the tower. The view was spectacular. We see a blue lagoon dotted with tiny islands. On one side we could see a tiny parking area for the waterboats . On the other side , just below were the green manicured lawns of the church. We spot the long narrow island of Lido where the best beaches are, the tiny islands of Murano and Burano where glass making and lace making flourish. 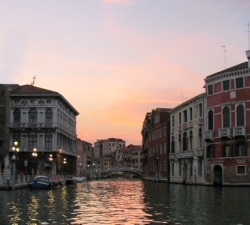 We see the mainland of Mestre and island of Venice as we know it with the Grand Canal threading through it. We stand there for ages darting from one nook to the other, drinking in the view. Almost as a reminder, the bell clanged, shocking us all by the intensity of the sound. With the echoes of the bell still ringing in out ears we made our way back to the mainland. Back to the Vaporetto. We got down near the Rialto Bridge , under which bridge the Gondoliers urge you to kiss your partners for luck. 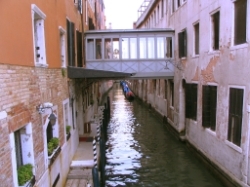 From Rialto we decide to walk to Santa Lucia through the bylanes of Venice . See the real Venice . We strolled around gazing at the pink houses with bright pink flowering shrubs at the window sills. Most houses have their backdoors opening into a small canal. Cars bicycles or any other kind of vehicle other than boats being disallowed, the residents of Venice do their grocery, carry out trash, and deliver mail all in tiny boats. To connect various houses, there are hundreds of tiny bridges all around the island. We ambled around entering a few souvenir shops, here and there. Since ages the Venice Carnevale that marks the beginning of Lent is an occasion here for people let their hair down. Masks were the means to hide all sorts of indiscretions. Mask making is a now a big cottage industry. Venetian paper mache masks of jesters with bells hanging from the jesters crown seemed to be the most popular ones. 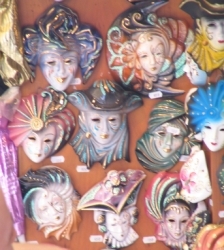 These masks were in all shapes and sizes, of jesters and queens and even a few animals. The other popular souvenir was the Murano glass. Pieces of multicolored glass blown into various shapes and curios, animals and gondola boats made for a very colorful display. In between the masks and glass, there were a few lace fans and tiny lace umbrellas, another local product. Venetian lace has always been a famous product. Back in Santa Lucia . We have dinner at the Italian chain restaurant called Café Brek. We finally get to try the famous Italian appetizer of Prosciouto with melon. Half cooked slices of Parma ham with fresh mush melon slices is not exactly my idea of delicacy but Seejo seems to enjoy it. Fresh pasta made in front of us and some sea food salad made up our dinner. We walk along the Canal side watching the sunset. Italians are watching the Euro football match on a TV placed in open air. Italy scores a goal as we pass them and the whole crowd erupts into a war dance. We smile and head off to the local gelataria for our obligatory gelato. We could not leave Italy without having one more. We sauntered along the tiny bridges savoring our triple flavored gelato and saying good bye to Venice and Italy .